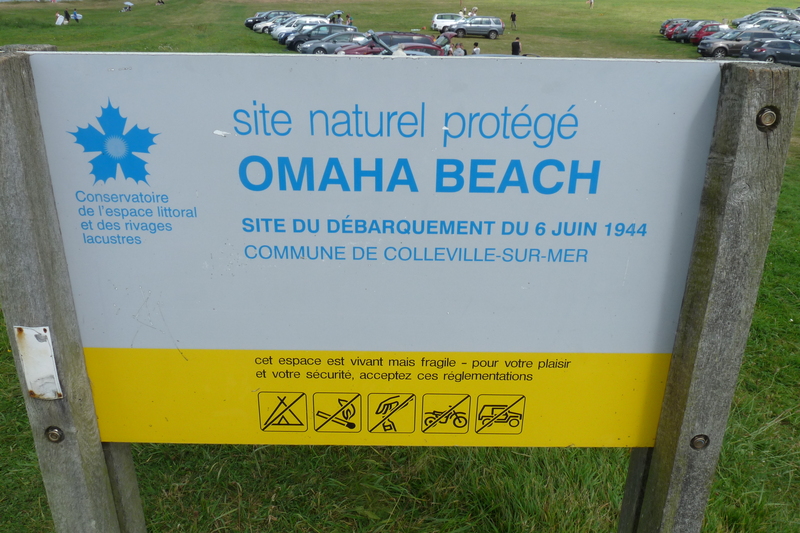 We traveled to Omaha Beach, working our way north -west on the French coastline. The drive there was not a difficult, since you really follow one road, which tracks the coast line. It was a beautiful day, the sky has some clouds passing, one or two looked like rain clouds,but it never produced any rain. There was a coastal wind that required you to have a light jacket, or a hoodie , which I learned to pack all the time (just in case..). This kind of weather , is the best for our kind of activities, walking around, driving to unknown areas, picture taking..sweating through your clothes was not possible in this kind of climate. 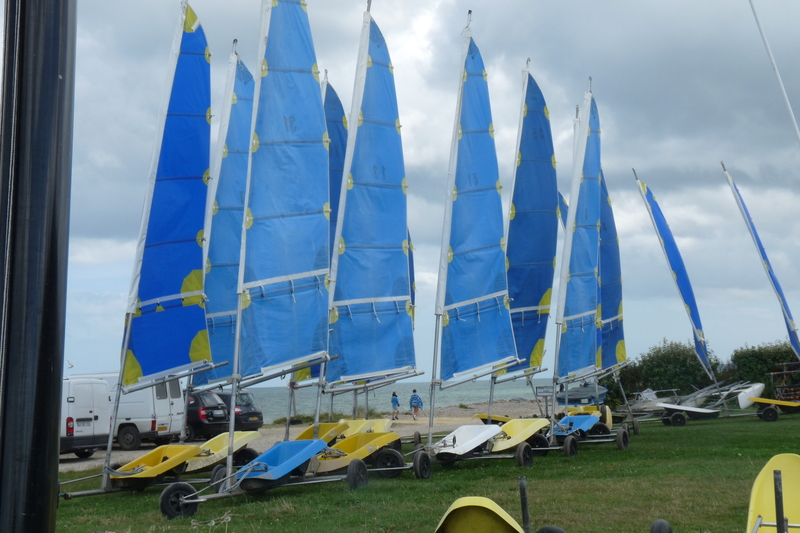 They also offered these beach – buggies – for rental. I guess the wind is a constant thing , around here. I was concerned about not finding the Beach, there is a lack of signs in this area. I am not sure if its on purpose or by misunderstanding. Were were supposed to find it by scent ?? This kind of practice is common in the South as well . The logic of lack of signs is simple “if you do not know where you are going to , then you do not belong here- go back” . We had to rely on another way to find the beach – “follow the crowd ” , alas … this system worked for the rest of our vacation. 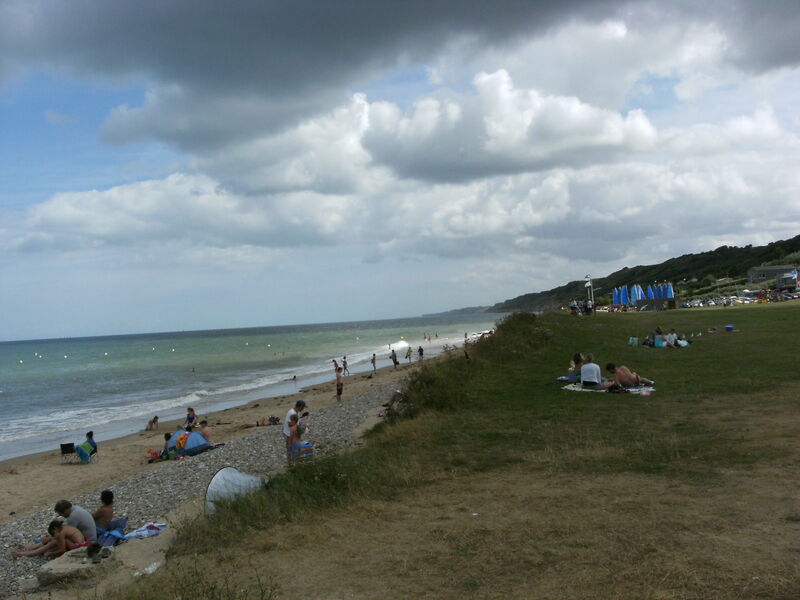 We came upon an area that looked like a normal beach parking lot- alas Omaha Beach. The sign was small – you would miss it from the road. We arrived, to find a non- altered beach. There was lots of people laying out -getting their share of skin cancer cells, or premature aging skin, but I guess all that wine drinking counteracts the sun damage. Some children were brave, and went into this chilled ocean to splash around. Families had picnic spreads on their little cotton blankets – plastic bottles of water everywhere. These french people take water drinking VERY seriously . 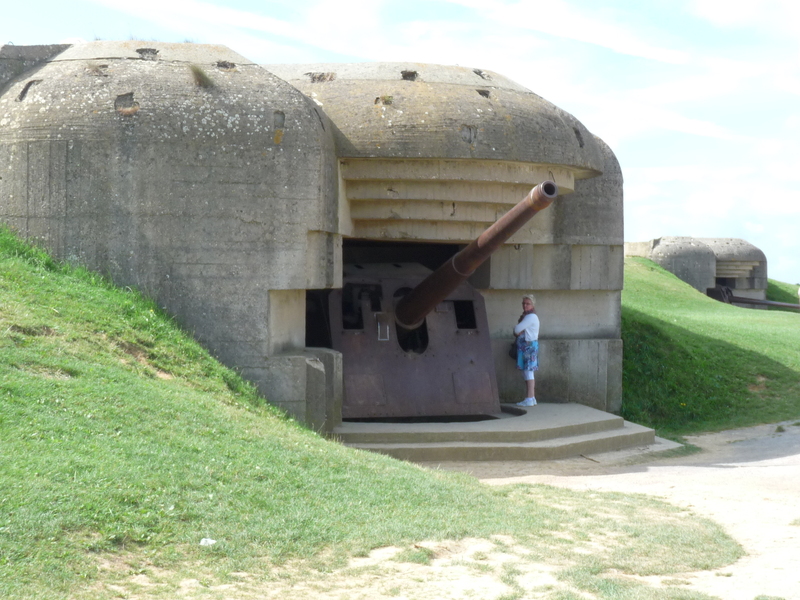 Walking around the beach, the German bunkers were here as well – but had a big difference . Now, they were built much closer to each other – as you can see in this picture. The cold deadly facts of this war, does not come to a person (i feel) , until your life is touched from it .. somehow. 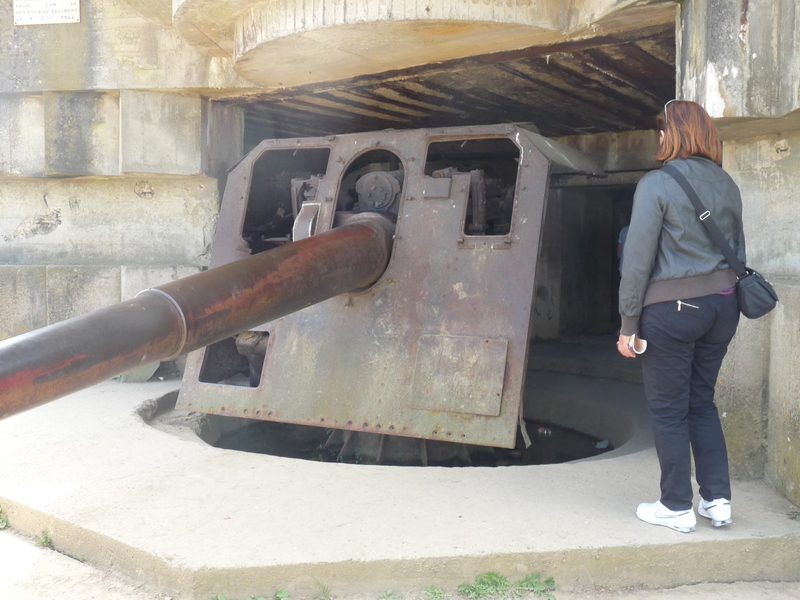 Standing in front of these huge concrete Nazi bunkers- with these huge anti – air guns- pointed at the ocean. The purpose is so clear – they were built to kill the Americans,English, Canadians, who were coming..There is no denying that evil exists, for I was standing on the ground- that was red, from blood , due to this fight – against upright evil, name Hitler.So they built the bunkers to defend the shore line, but if that line was breached – then the Nazis had no plan B . 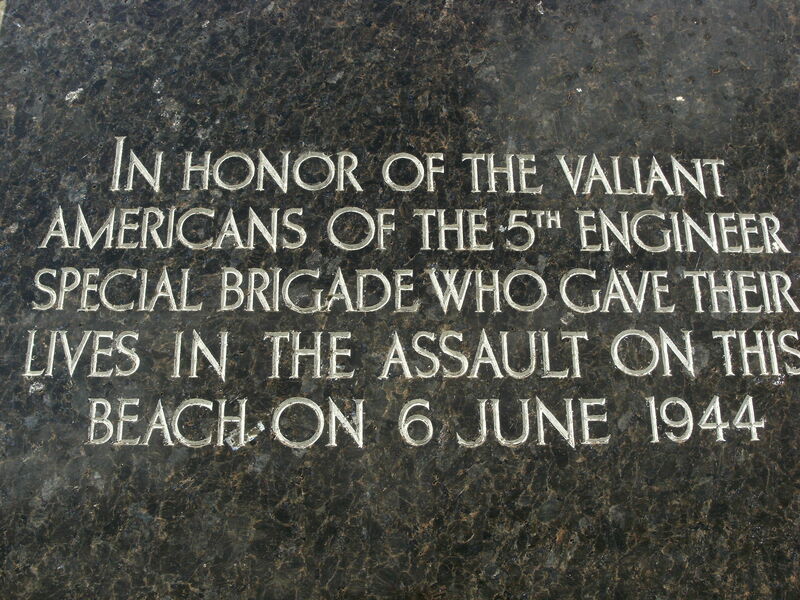 This helped the troops – but capturing the beach was a problem on its own. Looking down at the beach- I recalled my history lessons. 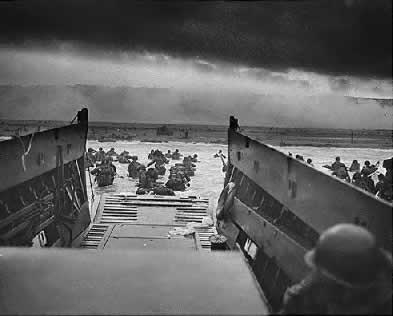 The troops had to jump in the water due to the inability of the landing crafts getting onto the beach. In the cold water the men went- strapped to their bodies was their gear. This additional weight could easy be an additional 50 pounds. There was so swimming to shore- because you had to keep your gun salt water free. If you were dropped into deep water, you drowned with the gear , sinking into a blue death. If you were “lucky” to have sand under your feet, you had to carry your gun, above your head – walking in cold water- with Nazi bullets flying by you. Sometimes you watched the horror of what these little chunks of lead can do … arms , faces , blood .. all merge into Hell. We ascended to the top of the hill, where a large stone monument stood. As I stood next to this engraved stone, a strange seed of anger was planted in my mind. This seed was to grow as the days and infamous visits continued. 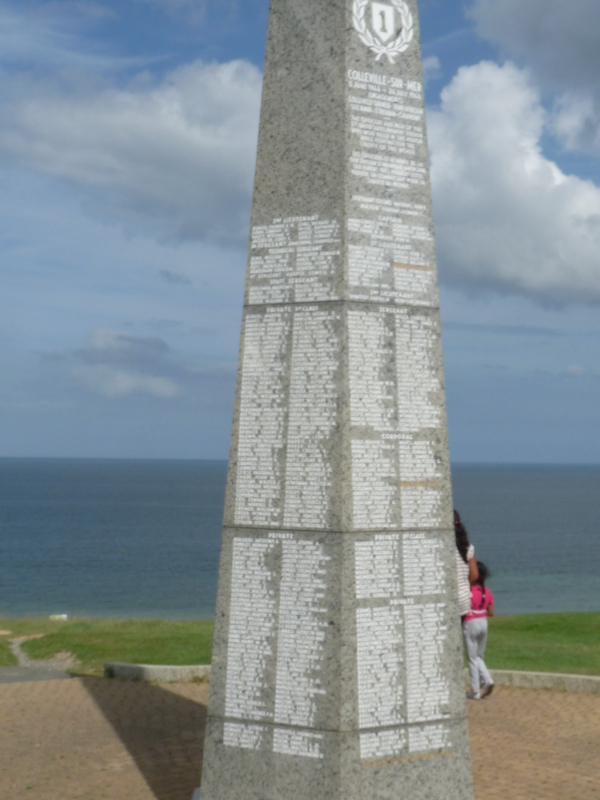 Looking at the long list of names of the dead men. The stone was grey- now, it matched the color of the clouds, and my mood. The list .. covered the stone , which was 18 feet high, and 4 sided. The names are listed in alphabetical order. There were stone seats available- which I was grateful for . I wanted to sit and take in the situation. How many tears were shed, when the families learned the fate of their men.? Did the tears ever end ? Now, 60 years later, I sit and watch various tourist come and go – taking pictures – like everyone does. The pictures capture the physical place, but can it capture the mood of the place ? I do not know. 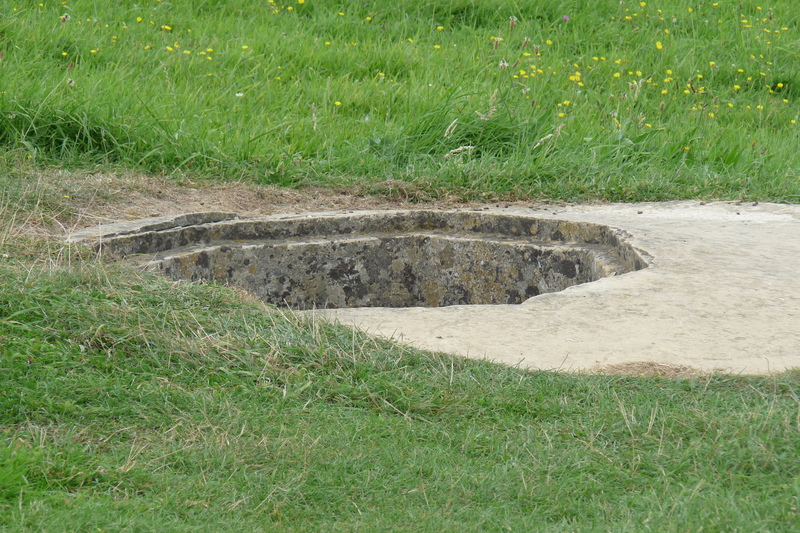 As we start to leave, I notice these huge holes in the ground – no signs to inform the visitor of what it is . I think, these were connected to the under ground bunkers the Nazis built- but can’t be sure. I looked down it, and it seems to be a tunnel. If the reader knows, please educate me. 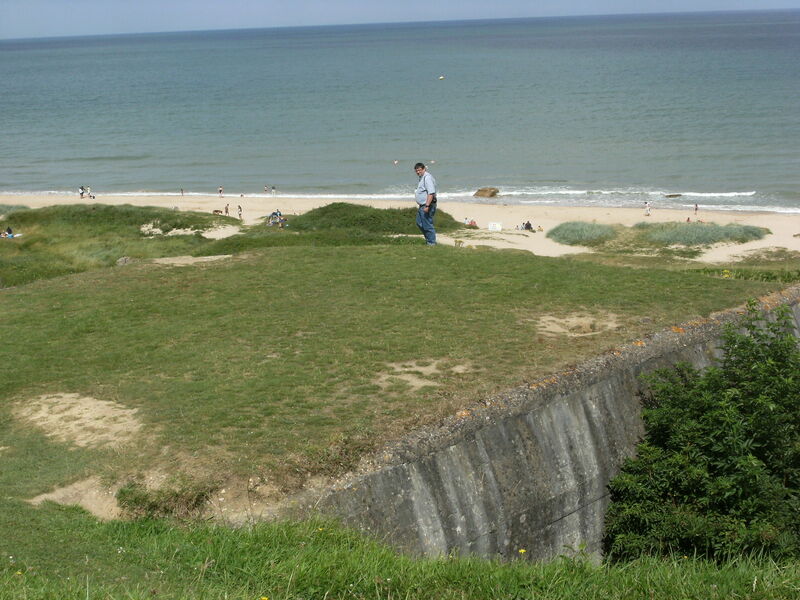 There was heavy fighting on this beach head, which the movie Saving Pvt Ryan showed. What I found difficult to find, was “facts sheets” at the various places we visited . I have tried to look online for casualties numbers, I found 2347 dead , was connected to Omaha Beach, but I also found a Fox News Report that stated , they still do not know the true numbers (attaching the link). Reading this information So i’m glad to exhibit that I have a very good uncanny feeling I discovered just what I needed.